I’ve already reviewed the first two Carnacki collections from author William Meikle, so when I found that a third one had recently been published by Lovecraft eZine Press, of course I had to pick up a copy of Carnacki: The Edinburgh Townhouse and Other Stories and get to reading it. I was very happy to see that the collection had been picked up by Lovecraft eZine Press because I’ve been a fan of Lovecraft eZine and the issues that used to be published by its editor and owner, Mike Davis, ever since I first discovered Lovecraft and his works a number of years ago. It used to be the first place I would go to find the latest Lovecraftian and Mythos fiction, and some of my favourite authors including William Meikle and Joshua Reynolds, had stories published in issues of the eZine; in fact, I think that might have been where I first discovered Mr Reynolds, after reading one of his Royal Occultist short stories in an earlier issue. So while I was disappointed to see the end of the individual issues being published, it was great to hear the announcement that Mr Davis had moved into publishing books, and I was determined to start picking up whatever was released by Lovecraft eZine Press. The first thing that I noticed with The Edinburgh Townhouse is that M. Wayne Miller had been retained as the cover artist. Mr Miller always produces high-quality, consistent and evocative illustrations, and the cover art he produced for this collection might just be my favourite out of all of his pieces – not only does it perfectly capture one of the key moments of the collection, when Carnacki and a visitor to the titular Edinburgh Town House are surrounded by boar-spirits from the Outer Darkness, but the detail is incredible. Carnacki himself is caught mid-incantation trying to repel the spirits, forehead creased, mouth open, eyes ablaze, and the boars themselves look as terrifying as they sound when described in the story, all rippling muscle, gigantic, razor-sharp tusks and unsettlingly white eyes. I think it really puts you in the mood for reading the collection, and also prepares you for what you’re going to find inside – magic, action, the occult and a lot of spirits that Carnacki has to deal with. It’s ben interesting to see the evolution of Carnacki as a character in the previous short story collections – Heaven and Hell and The Watcher at the Gate – that have been published. In the first set of stories he was very much an occult detective, with an emphasis on the latter part of that description; he focused on clues and leads, attempting to dismiss any rational explanations for a case before accepting that there was an occult influence in play. The events of the novella at the end of that collection however – The House on the Borderland­ – had destroyed his preconceptions about the powers and range of the forces of the Outer Darkness; and the second collection showcases a much-changed Carnacki. By the time of The Watcher at the Gate he is far more intense and knowledgeable about the occult forces he faces, but has become slightly reckless in the cases he encounters, conducting little investigation and instead focusing on utilising his knowledge and technological prowess to battle the Outer Darkness. This theme continues in The Edinburgh Townhouse, with Carnacki developing more nuanced technology to aid in his cases, but also taking more risks and becoming more aware of the degrees to which the Outer Darkness affects humanity and our reality. The collection itself consists of ten short stories, all never before published. The opening tale, The Photographer’s Friend, begins as quite a light and whimsical tale of a photographer who finds that his camera seems to be taking pictures of an oddly-shaped creature who sits on the shoulders of his clients, and is becoming more solid with every picture. However things rapidly go awry for the photographer despite Carnacki’s best attempts at dispelling the spirit; and there’s a particularly abrupt and downbeat ending that Mr Meikle deftly uses to highlight that Carnacki is not an occult superhero, and that even he can become frustrated and make mistakes that can end in tragedy. Fins in the Fog and The King’s Treasure see Carnacki once again involved in the affairs of the piratical Captain Gault, another character originally created by William Hope Hodgson that Mr Meikle fleshes out. They’re both fantastic adventures, straight-forward clashes with some element of the Outer Darkness that Gault has stirred up in an attempt to claim some cursed wealth; Fins in the Fog is particularly good, the author depicting a frankly terrifying series of encounters with an undead shark that can travel over land in an attempt to kill Gault, and which has a surprisingly melancholy ending as Carnacki realises why the shark has been pursuing the Captain. 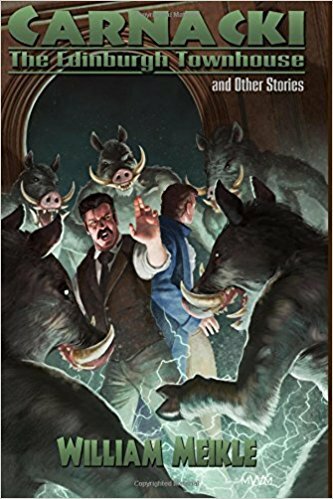 Carnacki: The Edinburgh Townhouse and Other Stories is another brilliant collection of Carnacki stories from William Meikle, and solidifies his mastery of the character, its canon and surrounding cast. The creatures of the Outer Darkness have never seemed quite so unsettling or powerful as they have in these stories; Carnacki has once again become more fleshed out, more realised; and Mr Meikle has even managed to make the detective’s listeners less two-dimensional, actually granting them some agency rather than leaving them as the simple surnames that Hodgson created. Hugely enjoyable, and I can only hope we see another collaboration between Mr Meikle and Lovecraft eZine Press with the Ghost-Finder.